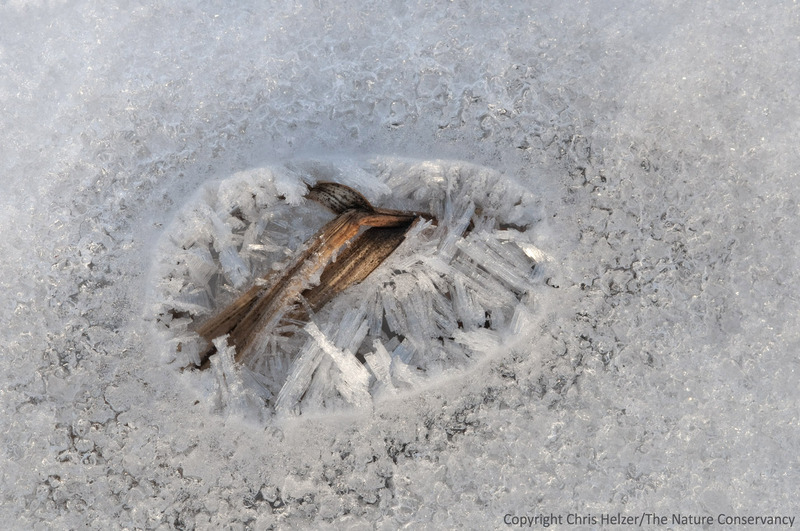 Hoarfrost on the edge of a hole in the snow, with prairie grass beneath. The Leadership Center Prairie – Aurora, Nebraska. Early morning hoar frost, calm winds, and a hazy sunrise got me out the door with my camera Tuesday morning. I found plenty to photograph, including frosty milkweed seeds, mouse tracks, and lots more. But it was the little windows in the snow that I couldn’t stay away from. It appears to me that many of the holes in the snow were a result of radiant heat, caused by the sun warming up the plants sticking out of the snow. Regardless of the reason, they were sure interesting to look at – especially with the morning hoar frost tinging their edges. Here are just a few of the images I came home with. 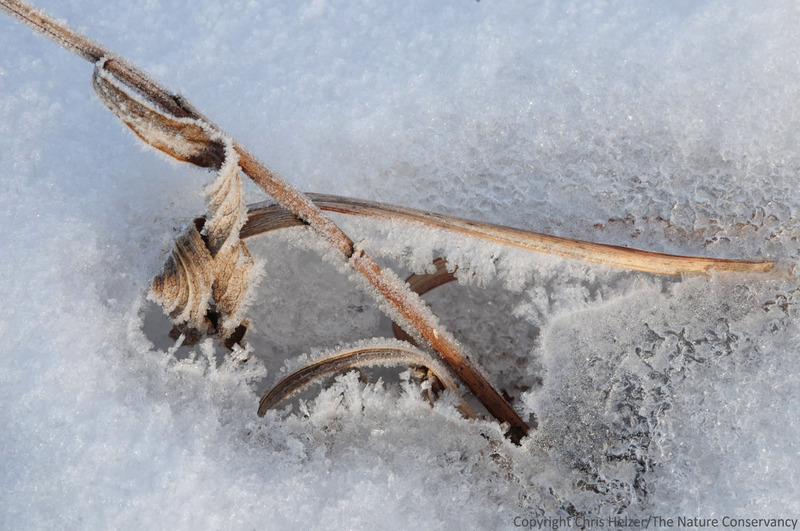 A stiff sunflower stem protrudes from a frost-edged gap in the snow. I assume many of the holes were caused by heat radiating from vegetation warmed by the sun? All in all, it was a pretty nice morning to be out. 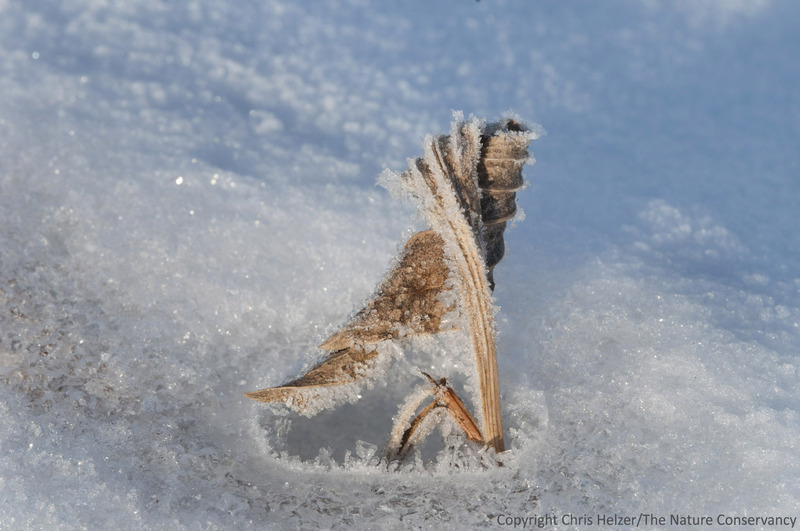 This entry was posted in General, Prairie Photography and tagged aurora, close-up photography, frost, grassland, hoar frost, ice, macro photography, nebraska, portholes in the snow, prairie, snow, windows in the snow, winter by Chris Helzer. Bookmark the permalink. Beautiful! The lines of that stiff sunflower and the plant in the last photo are just so expressive of frozen movement. They actually kind of remind me of a coiled praying mantis, or maybe even a ballerina caught in the moment of uncurling from being a sleeping swan or flower. Thank you for taking the time to share these shiny gifts that winter gives us. Chris, Do you ever see weasel tracks in your prairies? I have been thinking about them and snakes a lot after Stephen blogged about his problems with voles. Check out this weasel/ground squirrel video. I think this one is a draw. I’m not sure I’ve ever seen tracks that I was sure were weasel, but we certainly have them around. For those who might be interested in viewing some wonderful close-up images of ice and frost, here is a link to the blog site of Tom Whelan, a gifted nature photographer who specializes in macro images. 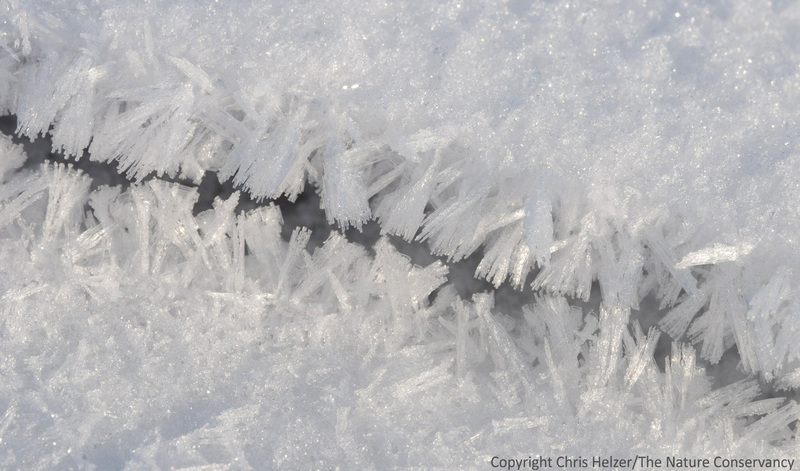 Tom’s images of frost and ice are among the best I have ever seen. He serves as the moderator of the Flora/Macro forum at Naturescapes.net. Beautiful photos! 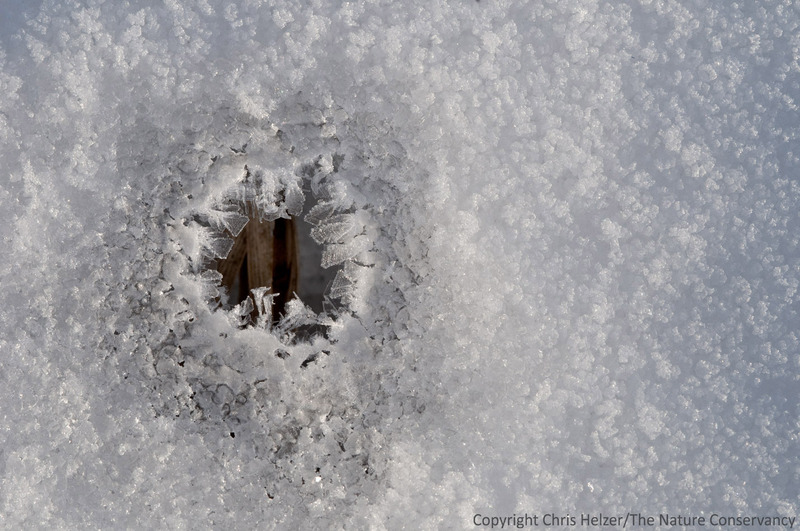 Your comments about holes in the snow reminded me of Andy Goldsworthy’s art installations.